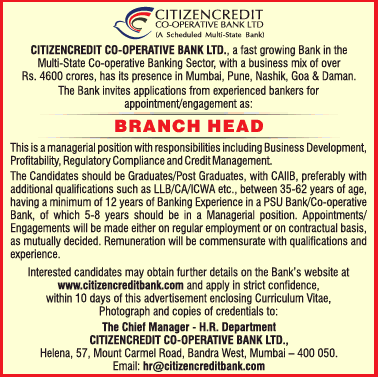 Citizencredit Bank Mumbai (Citizencredit Co-op Bank Ltd), Mumbai published a new job notification for Branch Head Posts. The willing candidates are informed to see the latest notification April 2019. Last Date of offline application is 13-04-2019. For More details of Citizencredit Bank Mumbai Recruitment 2019 Read Below. Education Qualification: Graduate/Post Graduate & More. For Post wise Education Details follow the detailed advertisement. Interested & Eligible candidates can send their application along with all the necessary documents and testimonials to The Chief Manager- HR Department, , Citizencredit Co-op Bank Ltd, 57 Helena,Mount Carmel Road,Bandra West, Mumbai – 400 050. Application starts offline 03-04-2019. Last Date of application is 13-04-2019.